The "King" had finally taken his throne (Mark Sobba/Flickr). Scouting Report: Felix Hernandez up until 2009 had been wildly inconsistent and hadn’t lived up to the “King” billing he received as a rookie. For some reason he didn’t seem to get up for the lesser teams as he would for the best in the league. This was a huge stumbling block keeping Hernandez from becoming one of the elite pitchers in the game. This all changed in 2009. King Felix has seemingly finally put it all together and has his mental and physical game working hand-in-hand. Hernandez has an incredible arm and dominating, electric stuff. He attacks hitters with an over the top arm action with a devastating arsenal including a two and four seam fastball (92-97 mph), a powerful slider, two different curves and a well placed change. He uses his four seamer as his predominant strikeout pitch which gives hitters fits trying to get a piece of. The best part of Hernandez’s awakening is the Mariners finally have a legitimate ace that they can plug in every five days and expect to win with. 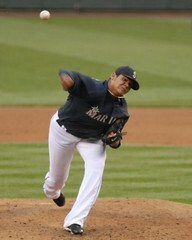 There are so few pitchers nowadays that you can say that about and its good to see Felix has evolved into that player. This entry was posted on Tuesday, December 1st, 2009 at 10:29 PM and is filed under Felix Hernandez, Scouting Report, Seattle Mariners. You can follow any responses to this entry through the RSS 2.0 feed. Both comments and pings are currently closed.